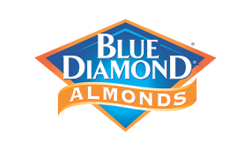 A company headquartered in Sacramento, California, Blue Diamond is the world's largest almond processing and marketing company. Blue Diamond almonds are the perfect choice for a tasty nutrition-packed snack. With no cholesterol, high in protein & fibre and 13 essential nutrients, Blue Diamond almonds are a delicious and satisfying snack for any lifestyle.